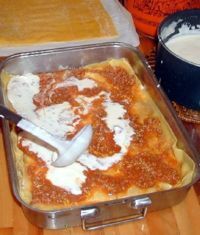 Lasagne is always a welcome casserole to serve guests or your family. This recipe can be a bit tedious, so is best reserved for special occasions. I like to decorate the top with swirls of Béchamel Sauce. There are two schools of thought on how long to cook the meaty sauce: long, slow cooking over very low heat overnight, vs short cooking time over moderate heat. I prefer the long version, but I remove it from the heat to the fridge when I go to bed, then reheat it the next day, before layering with the pasta. Bolognese sauce can also be made without tomatoes. In this case, a rich brown roux is used. This is probably the old, traditional method, used before the great explorers brought American tomatoes to Europe. See Bolognese (Bolognaise) Sauce – Variation without Tomatoes. Lasagne pasta is cut in wide strips, about 1 ½”or more wide, and about 10″ long. If you make your own pasta, so much the better! Or buy fresh pasta if you can find it. Otherwise, use a good brand of dried pasta. I prefer to use the variety that has curly edges, as it holds the sauce better, but flat lasagne will also work. When placing the cooked pasta in the pan, I like to lay it in a wave pattern (with high and low areas), which also helps it to hold the sauce in place. If you are avoiding grains, try using zucchini slices in place of the pasta, as in the Florentine Lasagne with Zucchini variation above. Another pasta option is Ezekiel Spouted Whole Grain Lasagne pasta. I don’t care for using Ezekiel pasta used a light tomato or creamy sauce because it overwhelms the flavor; but this strongly flavored meaty sauce stands up to the challenge. Sprouted grains are more healthful than when not sprouted. my Bolognese (Bolognaise) – Meaty Tomato Sauce, which is made with Italian sausage (pork) and ground beef, with fresh (or canned) tomatoes, tomato paste, red wine, and no milk. 7 – 8 cups Bolognese sauce (see below or Bolognese (Bolognaise) – Meaty Tomato or Tomato-less Sauce). Preheat oven to 400°F. Oil the baking dish. Start with bolognese sauce at room temperature. Add egg yolks and seasonings (use ½ Tbsp salt) to ricotta; whisk until combined, then chill. Cook noodles in water with remaining 1 Tbsp salt until al dente, about 2 – 3 minutes less than recommended. Drain. 3 cups sauce, then ⅓ of the noodles then ½ of the ricotta mixture and a sprinkling of the grated cheese. Follow with another ⅓ of noodles, 2 cups of sauce and remainder of ricotta mixture and another sprinkling of grated cheese. Then the last ⅓ of noodles, sauce and top with mozzarella rounds. 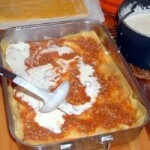 Or top with Béchamel sauce instead of cheese. 6. Bake preheated oven for 1 hour or until cheese melts. This version is made with milk. If you want a version without milk, see Bolognese (Bolognaise) – Meaty Tomato or Tomato-less Sauce. I prefer to make my own tomato paste, because the canned variety leaches toxins from the plastic epoxy that lines the can (or leaches lead from the solder, if the can is not lined). This makes about 2 quarts, enough sauce for an 11″ x 14″ x 3″ lasagna. Saute onions in butter and oil in saucier. Add celery and carrots and cook until tender, 8 – 10 minutes. Add milk and simmer for about 50 minutes. Do NOT let it boil. Skim fat from surface. Add wine and simmer abut 40 minutes (reduce again by half). Add stock, tomato paste, salt and pepper. Simmer until thick, about 40 – 45 minutes. This entry was posted in Alcohol, Baked, Beef, Buffalo, Dairy, Eggs, Fat or oil, Game, Herbs, Lamb, Onion family, Pasta, Pork, Root Veggie, Sauteed, Simmered, Stock, broth, Vine veggies and tagged bechamel, beef stock, carrot, cayenne, egg, ground beef, ground turkey, ground veal, milk, mozzarella cheese, nutmeg, onion, parmesan cheese, pasta, ricotta cheese, romano cheese, tomato, wine. Bookmark the permalink.